>>> and 12,000 federal prisoners sentenceded because of crack-cocaine could have their sentences reduced because of a retroactive law applied by congress. under the old rules a violation that would land a powder cocaine user in jail for one day would have put a crack offender behind bars for 100 days , and now the ratio is one day to 18 days. the commission's ruling affects primarily nonviolent offenders sentenced under a 1984 harsh law for crack-cocaine offenses, and half of these people sentenced are after can americans. 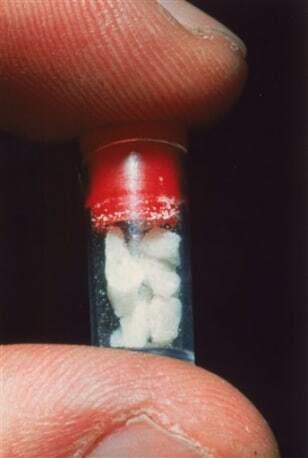 A plastic container of crack, the smokable, purified form of cocaine, is displayed in Boston.